We are boy moms. Diane and I have a daughter each and two sons a piece. Diane also has grandchildren, most of whom are boys. We love our daughters and we know that our culture has some special snares and traps for them. But as mamas of boys, we are particularly aware of today’s cultural assault on traditional masculinity. Specifically, we know that today’s boys are growing up in a world that desperately needs godly men and is suffering from a serious shortage of authentic spiritual leadership. In particular, we are troubled by how poorly represented boys are in wholesome modern literature. There is just too much Percy Jackson in our world today and not nearly enough Captains Courageous or Ralph Moody. There are some notable exceptions, Henry and the Chalk Dragon being an excellent one. 100 Cupboards being another. Since most of our modern boy books leave a lot to be desired, I have enjoyed reading backward through the good boy books of the 1960s, 1950s, 1940s and so on. Along the way, my family has fallen in love with Henry Huggins, Alvin Fernald, Homer Price, Henry Reed, Danny Dunn, the Mad Scientists Club, the Hardy Boys, the Boxcar Children, the Happy Hollisters and others. As I preview or read aloud these boyishly beautiful books, I am finding delicious and wholesome food for my boys’ moral imaginations. In many of the “boy books” conversations that come up in our Book Club, I see one tile frequently recommended which troubles me. Initially I had not planned on reviewing any of the John D. Fitzgerald books. I did not like them, I knew that they were very popular in our group, so I thought it best to leave them alone. Last month at my local charity resale store, however, my son discovered The Great Brain on the shelf and asked me about it. He remembers when we read it a few years ago. He knew that I didn’t like it, he remembered not liking it himself, but he couldn’t remember why. I realized that it was time to write a review. It is not my intention to offend anyone in writing this. I am merely offering my observations in the hope that it will help other families make the best decision for their homes. Instead of summarizing the story and offering some critique, I thought that I would share some pictures from the story and explain why I found passages like those photographed to be troubling. For me, these passages signify a general attitude which is not that of living as “children of light.” If these passages were resolved with right attitudes, I might feel differently. In most cases, however, these are left unchecked. Overall, the book does resolve well, but not without making some unsettling mistakes without rectifying them. In the first chapter of The Great Brain, Fitzgerald is building his scene. He wants us to understand that in the Utah community in which his characters live, the vast majority of the population is Mormon, but his title character lives in a non-Mormon family. I simply don’t care for this kind of “tolerance.” I am not raising weak children who are afraid of righteous fights, but neither my husband nor I think that a scene like this does much to teach our children how to handle differences of opinion in ways which are good, true, and right. If this were an isolated case, I would have chalked it up to school yard antics. Sadly, this third paragraph of the first chapter is not isolated. It is setting a tone that sounds throughout the rest of the story. Later in the same chapter, Fitzgerald introduces us to Papa. It is clear here, and in many other places, that the brothers have a low opinion of, and disrespectful attitude towards, their father and other male authority figures in the story. Throughout, the Great Brain is condescending toward adults and encourages his brothers to view the plumber, the Greek immigrant, their father, and other men with callous disrespect. The chicken pox and mumps chapter, TD (Tom, aka “The Great Brain”) is packed with nonsense. After everyone has had and recovered from the chickenpox, John sneaks out of the house and sneaks into the house of a sick friend (hiding from their mothers) all so that he can get the mumps and give them to his brothers. This is dumb and dangerous. Lying and sneaking around are just part of the general narrative of the story. After everyone has recovered from a bout of chickenpox and a now a bout of mumps, Tom gets even with John for getting them sick. In the example below, the parents use what I consider a cruel technique for punishment and the boys end up applying it to each other. Angry about having gotten the mumps from John, Tom convinces their brother to give John the silent treatment for a month. The situation is resolved by Tom manipulating a pricey and special belt away from his brother thus ending the silent treatment. This chapter was no fun to read and it will not help my children learn to live at peace with each other. In this chapter, there is a fair amount of conversation about dogs mating. If you desire to avoid that topic with your little ones, know that it is unavoidable in this chapter, and that it features prominently in a much bigger chapter story arc. After this scene, we find out that two boys and their female dog (who is in heat) have not come home for dinner. The next day a family member comes to speak to the parents. The boys disobey their mother, sneak out, and use a secret method that they have come up with to listen in on the private conversations of their parents. As it turns out, the boys are lost in an unexplored and dangerous mine. For two days the town tries to find the boys without getting lost themselves, to no avail. In another chapter, Basil is abused by other boys. They are playing “Indians.” They tie up and sincerely scare the non-English speaking immigrant. Tom and his brother do rush in and save their new friend. It is unselfish and noble. But it doesn’t stay unselfish for long. JD (John) predicts that his brother Tom will find a way to make more profit on this friendship in no time at all. Until this point, the story hinges on a lot of bad behavior between boys. I resent how in each chapter impressionable John (the narrator) expresses his good conscience, and his older brother, The Great Brain, Tom, skillfully manipulates him into darkness. I regret that the there is no storyline here except to poke fun at adults and make kids into heroes in rather vile ways. At this point, however, the story takes a turn. One might argue that it turns for the better. I can see how the ending is much better than the beginning. Sadly, however, the path into this change is pretty gruesome. Papa is not Mormon and he encourages a friend to open up a goods shop in town. Jewish Abie is skeptical and worried about the prospects of opening a store in a town where all of the Mormons are required by their Bishop to shop at the Mormon store. Abie is a poor man and has very little to gamble with. Papa assures him that little by little the town is diversifying and that non-Mormon business and tradesmen are doing well. To encourage Abie’s business, Mama would give her shopping list and money to the boys and tell them to patronize Abie’s store. 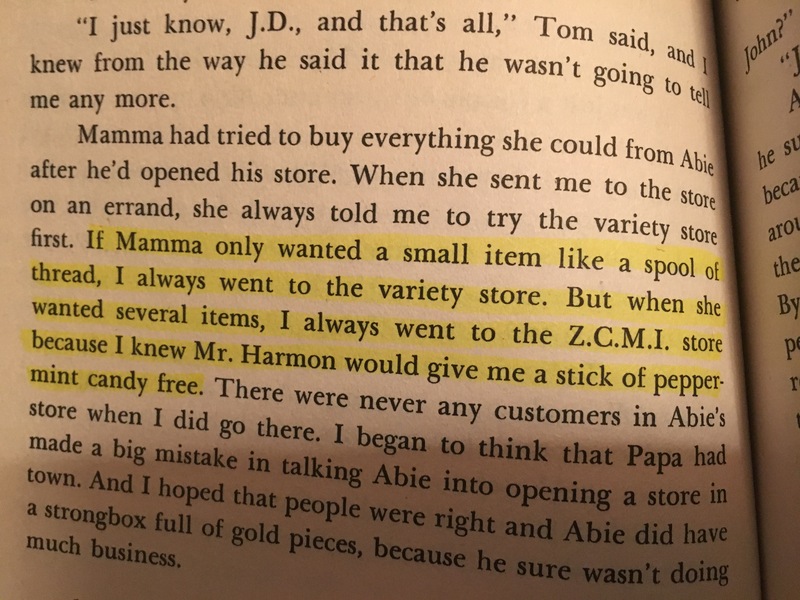 But, John admits that whenever mama has a big order, he decides to disobey her and shop at the Mormon store instead, where he gets free candy. Tragically, the consequences are fatal. Abie’s store is a failure and the devout Jewish man slowly starves to death while no one notices. This theme is way too complicated and too dark for a children’s book of this ilk. In Chapter 7, the kids are frustrated with their new teacher. The Great Brain serves as a ringleader in an attempt to get the new teacher fired. 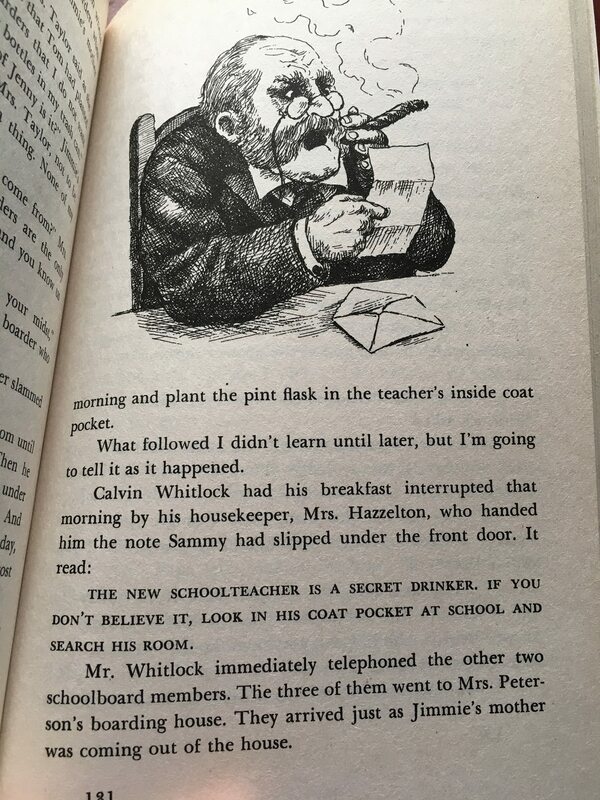 He organizes his classmates to steal alcohol from their parents, combine it, and hide it in Mr. Standish’s coat. They then slip a note under the door of the school board president’s house implicating the teacher in scandal. 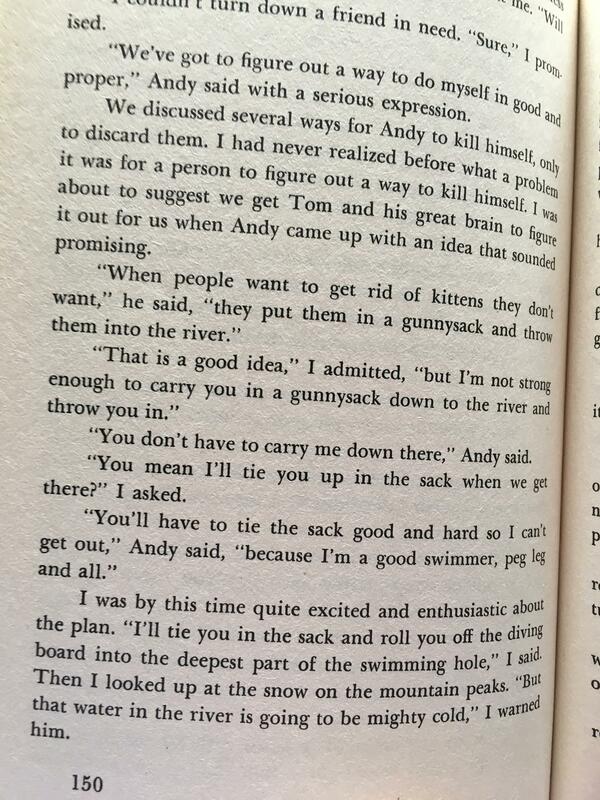 In chapter 8, John’s friend Andy wants to commit suicide. Months before this story starts, Andy had stepped on a rusty nail in an old barn and refused to tell his parents for fear of being disciplined. Needless to say, the ensuing infection cost him his leg. Disabled and unable to play with his classmates, Andy doesn’t want to live any more and he recruits John into helping him end his life. Tragically, the boys make multiple attempts through various means. Ultimately, Tom intervenes and gives Andy a reason to hope that his life won’t be “plum useless”. True to form, the way that Tom proves Andy’s usefulness is to help Andy figure out how to do Tom’s chores. Even when Tom is doing something good, he manages to get something out of it. I wish that I could understand the appeal of this book, but I can’t. More importantly, there are so many other options which are much more winning and a much better fit for my family. Wow, Thanks! Based on those passages, that is certainly not the type of input I want being applied to my son’s perspective of the world. I know it can be nerve-wracking speaking up about issues with something that is popular. I appreciate your courage and the grace to which you applied to the situation. Blessings! Thank you Nicole! Thank you so much! I am just so glad that this helped. Thank you. I haven’t ever given my children Great Brain, but I have heard of it many times. I think I read one as a kid and didn’t think much of it, but reading these passages, they won’t be on my to read list. I am not sure what year this is set in, but a Mormon Bishop wouldn’t be requiring all the church members to go only to the Mormon store, and how does that first paragraph teach about coexistence and loving our fellow men? I have many friends of different faiths. We may not agree theologically, but that doesn’t make them lesser people or me a lesser person for that matter! Fitzgerald is the son of a Mormon and a Catholic in a Utah Mormon town. (His semi autobiographical work “Papa Married a Mormon” gives much more detail.) When I referenced the Mormon requirement to shop at the Mormon store, I am referencing what he said in The Great Brain. I can’t attest to its real life accuracy, but it is what is in the text. Papa is a Catholic, and he is distraught over Abie’s death. He gives a stirring speech about how the town looked the other way when the Jewish man was in trouble. I think that this book, right or wrong, is illustrating some genuine religious tension that existed in his childhood.